This Post has already been read 311 times. A 5 week long, fully funded entrepreneurial exchange to Oklahoma! This international partnership is the result of the efforts of Faizan Mahmood, Head of Strategy at Innovation District 92 and Elanie Steyn, Associate Professor at University of Oklahoma. 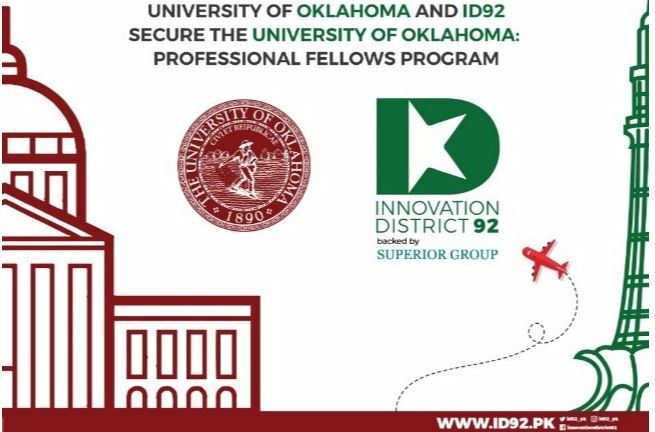 Innovation District 92 is the in-country partner for The University of Oklahoma, through the Gaylord College of Journalism and Mass Communication, in connection with the United States Department of State, Professional Fellows Program. In this program two cohorts of 3 Pakistani entrepreneurs/business educators/business professionals will travel to the U.S for a five week exchange each. One or two delegations of American entrepreneurs, business professionals or business educators will visit Pakistan. What Will You Gain Through This Experience? Have the opportunity to reconnect with Oklahoma stakeholders who will make reciprocal visits to Pakistan, India, Nepal and Kazakhstan.